The Barrow's goldeneye (Bucephala islandica) belongs to the family of ducks, geese, swans and goldeneyes, the Anatidae. 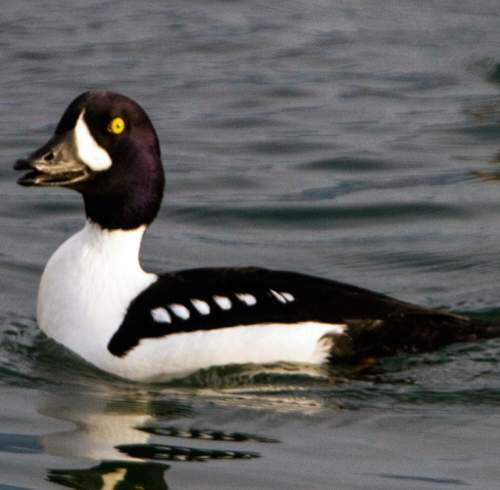 The Barrow's goldeneye is distributed in the USA, Canada, Iceland and Greenland. This goldeneye species was named after Sir John Barrow, an English statesman and writer. This goldeneye is a monotypic species. The Barrow's goldeneye (Bucephala islandica) is a medium-sized goldeneye, measuring 40 to 50 cm in length and weighing 600 to 1300 grams. The males are larger than the females. The wingspan is 70 to 80 cm. 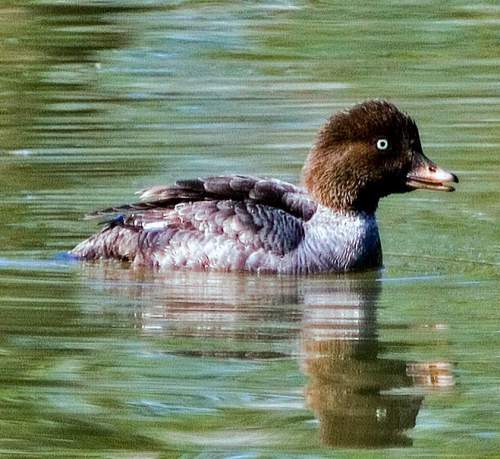 The male Barrow's goldeneye has black upperparts and tail. The head, nape, crown, neck and throat are black with purple gloss. There is a crescent shaped white patch on the face. The wings are black and have white patches. The breast and the underparts are white. The females have bluish gray head and pale gray body with striations. The bill is short and colored black in males and yellowish-orange in females. The irises are pale to dark yellow. The legs and feet are orange yellow. Their call is a burping, grunting or croaking sound. 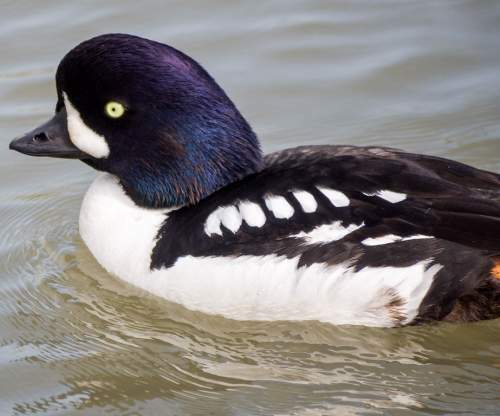 The Barrow's goldeneye species are distributed in USA, Canada, Greenland and Iceland. Vagrant birds are observed in United Kingdom, France, Germany, Spain, Norway, Russia, Serbia and South Korea. The Important Bird and Biodiversity Areas (IBA) of these Barrow's goldeneye species in USA are Prince William Sound, Glacier Bay and Icy Strait. The IBA of these goldeneye species in Iceland are, Veidivötn, Apavatn-Laugarvatn, Sog, Brúará and Mývatn-Laxá. The IBA in Canada are English Bay and Burrard Inlet. The Barrow's goldeneye species have moderate forest dependence. They normally occur in altitudes from 0 to 3000 meters. The natural ecosystems and habitats of these goldeneye species include boreal forests, temperates forests, coastal marine lakes, tidepools, shallow seas with macroalgae and freshwater lakes. The diet of this Barrow's goldeneye species consists mainly of molluscs and crustaceans. Mussels, gastropods, amphipods, crustaceans, aquatic insects, insect larvae and aquatic vegetation are their primary food. The breeding season of these Barrow's goldeneye species is from May in most of their breeding range. These species are monogamous and territorial. The mating pairs reunite at the wintering grounds. The nesting sites include natural holes in the ground, tree-holes in mature trees and nest boxes. The clutch contains 8 to 10 white eggs. These Barrow's goldeneye species are partially migratory birds. Breeding populations occurring in Alaska and western Canada migrate to Pacific coasts of Canada and northern USA for wintering. The goldeneye breeding populations in eastern Canada (Quebec, Newfoundland and Labrador) winter in the coasts of the nearby islands. The Barrow's goldeneye populations in Iceland are sedentary. Post breeding, the juveniles may disperse and establish in new locations within the range. Within their range they may make local movements for feeding and breeding. The global population size of the Barrow's goldeneye (Bucephala islandica) is estimated to number about 200,000 mature individual birds. The overall population trend of the species is considered to be increasing. In most of its range, this goldeneye species is reported as common to uncommon. The generation length is 8.1 years. Its distribution size is about 16,900,000 sq.km. Habitat alteration, human activities, deforestation, oil-spills, climate change, hunting, egg collection and capture for pet-trade are the main threats that are endangering the survival of this goldeneye species. The Barrow's goldeneye (Bucephala islandica) does not approach the thresholds for being Vulnerable either under the range size criterion, or under the population trend criterion or under the population size criterion. The IUCN (International Union for Conservation of Nature) has categorized and evaluated the goldeneye species and has listed it as of "Least Concern". The CITES (Convention on International Trade in Endangered Species of Wild Fauna and Flora) status is ‘Not Evaluated’ for the Barrow's goldeneye (Bucephala islandica). The Barrow's goldeneye (Bucephala islandica) is closely related to common Goldeneye (Bucephala clangula). Current topic on Birds of North America: Barrow's goldeneye - Bucephala islandica.